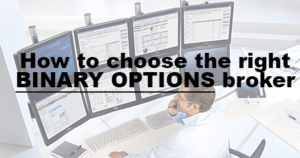 The world of binary options trading offers many exciting opportunities which can be best enjoyed with the guidance of a binary options broker. Choosing the most suitable broker for your trading needs can be a daunting and lengthy process. However, you must realize that a broker is your business partner who will accompany you on every trade. That is why you should put special attention to the process of choosing your broker. The broker can then help you to perform better when trading and instruct you on getting the best return on your investment. There are plenty binary options brokers on the market. There are regulated brokers, unregulated brokers, scam brokers (fraudulent brokers), long-time reliable brokers, new brokers, brokers with fast or slow trading platform, etc. There are literally hundreds of them. I can’t tell you exactly how many binary options brokers there are, but I guess there are around 600 and perhaps even more. No wonder that new traders sometimes do not know which broker they should choose. There are various criteria and factors which can help you to choose the right broker. We would like to make it a bit easier for you, so on our website, you can find a list of recommended binary options brokers. We personally verified each of the brokers and if you decide to open an account with any of them, you don’t have to be worried about anything. It’s not easy and that is why I decided to prepare these tips on how to facilitate the process of selection the right broker and how to find the best broker for your trading needs. Below you can find a list of criteria, which you should consider while choosing a broker. The weight you are going to put on each criterion is just up to you. Payout – Binary Options trading produces varied payouts. Some brokers (for example IQ Option) offer payouts as great as 92% per trade; other brokers can offer you payout as high as 250% (depending on the option type). The Payouts differ from broker to broker. Some brokers also offer to refund you 5-10% from your non-winning investments. The aim of most people is to reach the highest payout possible and make a lot of money. With a great binary options broker, you can get it, that is why you should choose very carefully. Expirations times – Check if the broker offers different expiry times of options. There shouldn’t be any problem because the brokers usually offer a huge variety of expiration times (5m, 15m, 30m, 1h., etc.). Minimum deposit – The trading platforms require different amounts of minimum deposit to start trading. Look for the amount, which is suitable for you. For example, with IQ Option broker the minimum deposit amount is just 10 dollars. AnyOption broker on the other hand allows deposits from 200 dollars. Trading tools – Some trading platforms offer trading signals, tutorials, social trading, automated trading, etc. Not all trading platforms offer the same trading tools, so choose that platform, which has the trading tools you use. Demo account – A lot of trading platforms take care of their clients, especially the first time investors, by providing them with a demo account. The demo account can help you to gain some trading experience before you actually deposit your own money. I strongly recommend you to try a demo account before you get to real trading because you can get to know the platform. Customer service – Find out if the trading platform has good customer service to cater for all of your inquiries concerning binary options trading. The Very good sign is when the broker offers online chat support in the Czech language. Simple user interface – Search for professional trading programs, which offer a simple user interface. This will help you to save time and effort while learning how to use it. Most of the programs are easy web based internet programs with interactive controls. Multiple asset offering – One of the biggest benefits of professional software is that they don’t restrict investing. Reputable binary options brokers should provide investors with possibilities to invest in various assets such as commodities, stocks, and currency pairs. This increase the profit margin for the investors. Multiple languages – The global binary option market is fast growing so most of the binary options brokers offer their pages translated into several world languages. It is not an exception, that a broker can offer 20 languages. The more languages the broker offers, the more people probably trust him. The binary options trading platforms can have a lot in common, but anyway, their way of trading may differ in terms of initial deposits, the maximum payouts, deposits and withdrawals options, expiration times and customer support.